Rhinoceros belong to the group known as the perissodactyls, or ‘odd-toed ungulates’, which includes horses and tapirs. 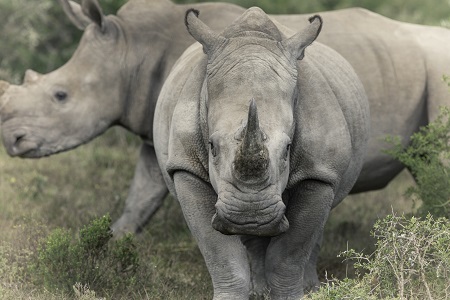 Characterised by their large size – all species can weigh more than a ton – rhinos have one or two horns, a thick skin made of collagen arranged in a lattice structure and a relatively small brain. Most rhino species lead largely solitary lives although home ranges sometimes overlap, with shared feeding grounds, water holes and wallows. The closest relationship is between a female and her calf, lasting from two to four years; as calves mature they leave their mothers and may join other females and their young temporarily, before living completely on their own. Males are territorial to varying extents, often marking their territory with middens of dung. Rhinos (especially Black rhinos) can appear rather ill-tempered – particularly in areas where they are either hunted or regularly disturbed – and their eyesight is poor, which might explain why they sometimes charge without apparent reason. They have an extended "vocabulary" of growls, grunts, squeaks, snorts and bellows. Wild rhinos have a 30-50 year life span. Pregnancy lasts 15-16 months and the 63kg new born calf relies on its mother’s milk for up to two years. The continuing threats from illegal hunting for sport and poaching for their horns (for use in traditional Chinese medicine) mean that rhino numbers have fallen dramatically from historical levels. Rhino habitats are encroached on by human population growth and associated agricultural development and domestic livestock – they are sensitive breeders and when land is severely fragmented populations become smaller and more isolated which limits breeding. Born Free works hard to protect rhinos on the ground, improve law enforcement in source, transit and destination countries, reduce demand through consumer education, and persuade governments to take action to enforce trade bans. Our campaign against the illegal and legal trade in rhino horn. We firmly believe that legalising trade in rhino horn would increase demand and put rhinos at greater risk of poaching. Investigation of the transit routes that wildlife crime operatives use to move rhino horn from source country to illegal market. Lobbying the South African and Swaziland governments to suspend all exports of rhino trophies and live animals and desist from any attempt to create a legal trade in rhino horn.